Are you looking for a healthy chicken wrap recipe for lunch? These Spicy Peanut Chicken Wraps are the perfect meal prep – it’s simple, healthy, delicious, and made in under 30 minutes! Disclaimer: this is post is sponsored by Mann’s. All opinions are my own, thank you for supporting the brands who make this blog possible! Let’s talk time saving. I was taught by Chef that you always prep prep prep. Every since I’ve streamlined my workflow when it comes to cooking, I’ve shaved off a ton of time meal prepping. For me, prepping includes pre-planning my meal prep (no more Sunday morning panics), laying out all the utensils I’ll be needing, washing/cutting all my veggies beforehand, and having the sink ready to to soak whatever tools I’ve used so washing is a lot easier afterwards. Gone are the days of me digging through the spice drawers looking for some sort of powder, and gone at the days I’m cutting my veggies last minute in a haste while something is cooking on the stovetop! Recently, to help with saving time meal prepping, I’ve started incorporating Mann’s Fresh Vegetables into my weekly meal preps. Mann’s Fresh Vegetables come pre-washed, cut, and are ready to eat as is! 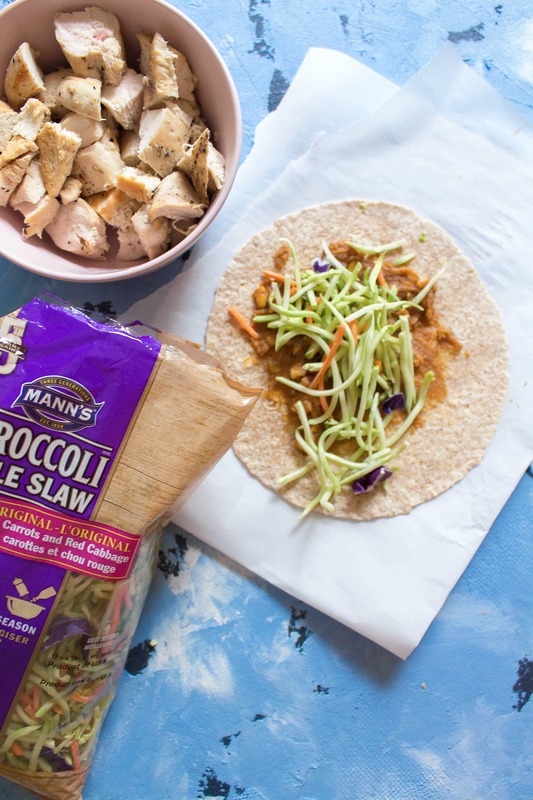 Adding a bag of veggies from Mann’s Fresh Vegetables saves me a good 5-10 minutes of cutting depending on how many types of veggies I want to incorporate into my meal. Definitely worth grabbing on your next grocery shopping trip if you’re looking for an easy way to save 5-10 minutes on your next meal prep. 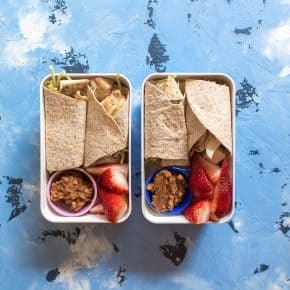 This week in my lunch box are these spicy peanut chicken wraps, this wrap meal is the perfect grab and go lunch as they don’t require re-heating! I love knowing that in one bag, there’s broccoli, cabbage, and carrots already pre-cut so my chicken wraps are loaded with vitamin A, C, and iron alongside the protein from my lean chicken without me having to cut a single veggie 😉 Plus the broccoli slaw gives the wrap a nice crunch! 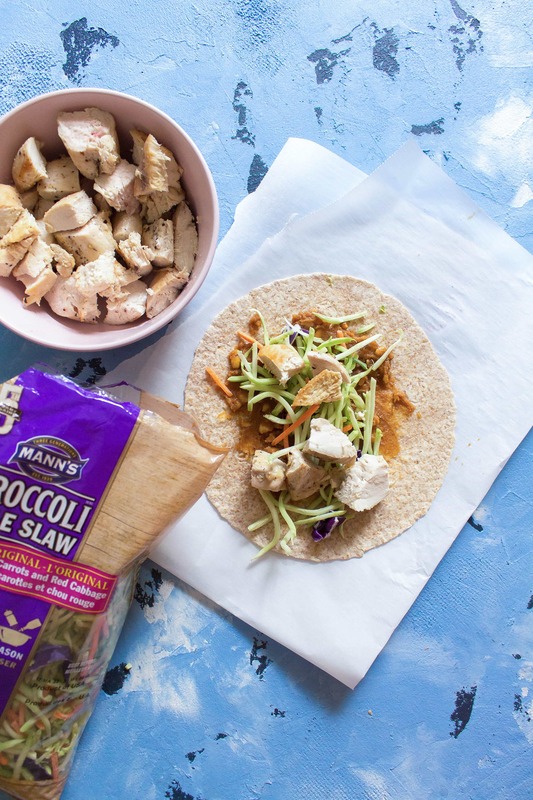 I promise you that these spicy peanut chicken wraps are so good that this easy chicken wrap meal will definitely get into your monthly lunch meal prep rotation! easiest and tastiest chicken wraps ever! In my bento box, I added some strawberries to add a bit of sweetness to contrast the spicy peanut sauce. Take your pick of fruit for yours if you want something sweet as you finish off your meal. 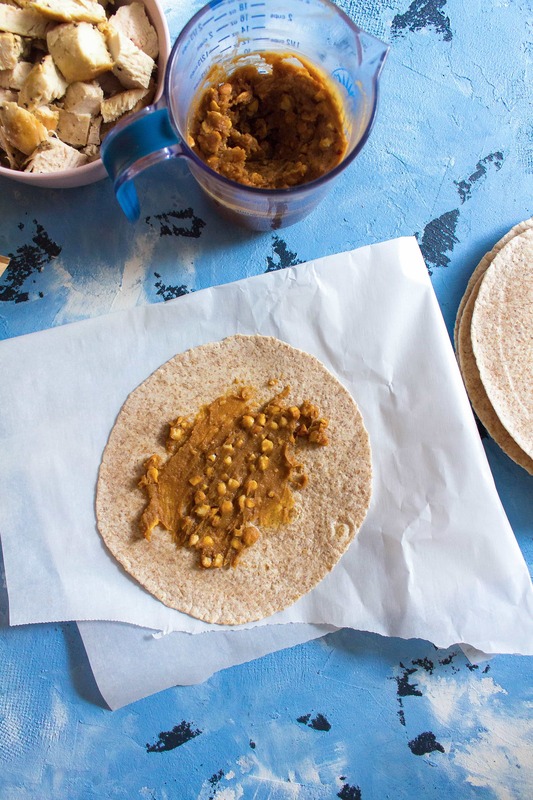 Want to make these spicy peanut chicken wraps into a family activity? 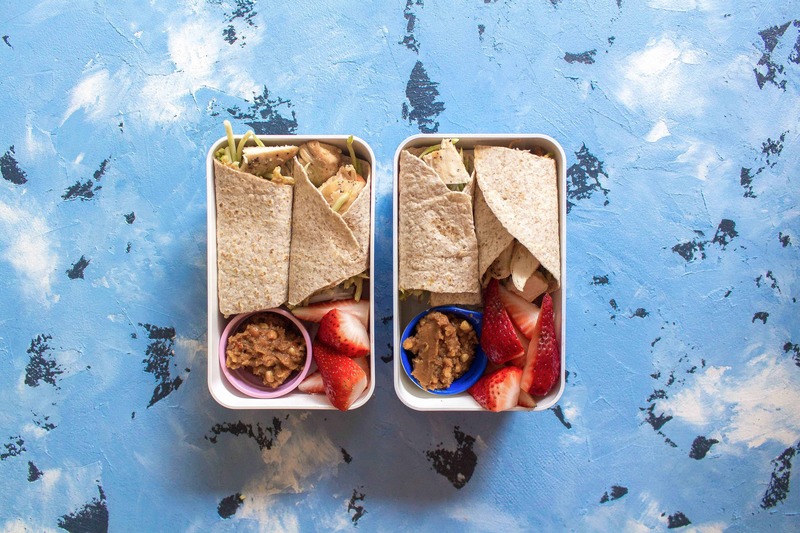 Set it up buffet style and have everyone DIY their own wrap to pack into their lunch boxes! These Spicy Peanut Chicken Wraps are the perfect meal prep - it's simple, healthy, delicious, and made in under 30 minutes! Heat up your pan and place your diced chicken (seasoned with salt and peppeand cook until it's cooked through. While your chicken is cooking, in a container/bowl, mix together your peanut butter, tamari, olive oil, garlic, Sriracha (or hot sauce), fresh lime juice, and water together to make your sauce. Add more water if the mixture is too thick. To assemble, on a tortilla, spread your peanut sauce before adding your broccoli slaw then chicken. Roll it together and either leave as is or cut it in half to fit into a smaller meal container. Optional: serve with fruit and a small container of the sauce if you wish to use it as a dip! Don't have time to cook your chicken? Get a pre-cooked chicken and shred it into the wrap! Let’s Chat! What kind of healthy chicken meal prep did you make this week? I’ve never been one for wraps but they’ve been growing on me lately because they’re easy and light. This one looks ideal – good chicken and some tasty peanut sauce is always a hit in my house! Updating my grocery shopping list now. Love an easy meal in under 30 minutes! Perfect for my busy week! Mmm these look BOMB!!! And like such a great picnic snack! These sound super good! Perfect for packing lunch, and eating al fresco this summer! That looks yummy and easy, that is always a bonus! Great for a picnic or school lunch. These sound so good! I love peanut sauces and these look perfect for a healthy summer lunch. You had me at peanut butter! This is definitely my kinda lunch! Tried this for work this week and loved it! You just solved my lunch dilemma, thanks Carmy!! This looks delicious–and easy, which is my favourite type of meal! I often buy broccoli slaw. It is perfect for salads….and just like this recipe, adding it to sandwiches, wraps and burgers. What a great meal plan recipe…makes things easier for busy weeknights. I love this wrap idea! So many delicious components and still very quick and easy to make. 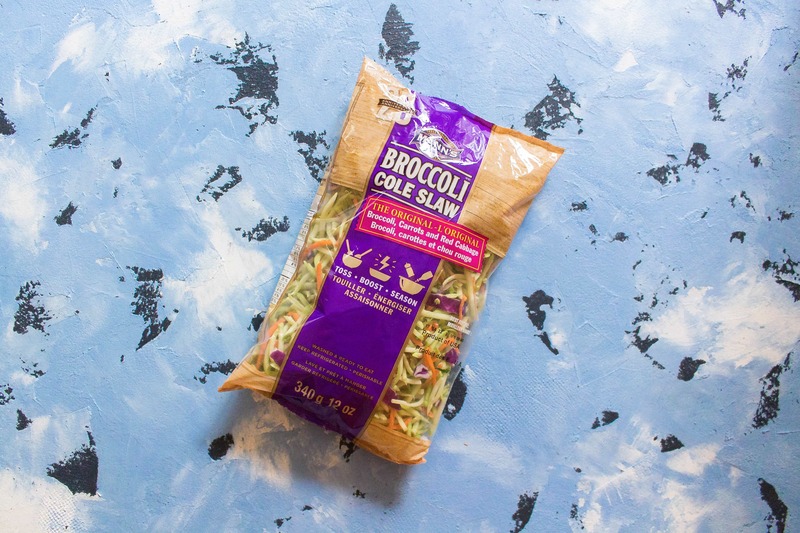 I love broccoli even a bit better than regular slaw – more nutrients too! Will have to try this for sure! This is perfect for healthy eating at work. It’s easy and transportable. I really like the broccoli slaw. I have been trying out the different pre-shredded slaws in a bag and this is one of my favorites. I love brassicas and the smaller portions in a bag means less waste. Thank for this! I rarely remember to meal prep, but I really need to! This morning I was in a panic trying to pack a lunch- planning ahead would’ve solved so many problems for me. And those pre-prepped veggies are a great lunch idea! I prefer wraps to using bread for a sandwich. Your chicken wraps look so good. I love the spiciness of it plus the crunch of the peanuts and broccoli slaw. A great take-along lunch. I’ve been really trying to do better with my meal planning and meal prep for healthier lunches, and these wraps sound like the perfect way to stay on track! That peanut sauce with the Sriracha sounds like one that I would want to put on everything. The flavors must pair so well together and that slaw must give the wrap such a great crunchy contrast! Best chicken wrap meal prep ever!! I really like the peanut sauce for the chicken wrap! 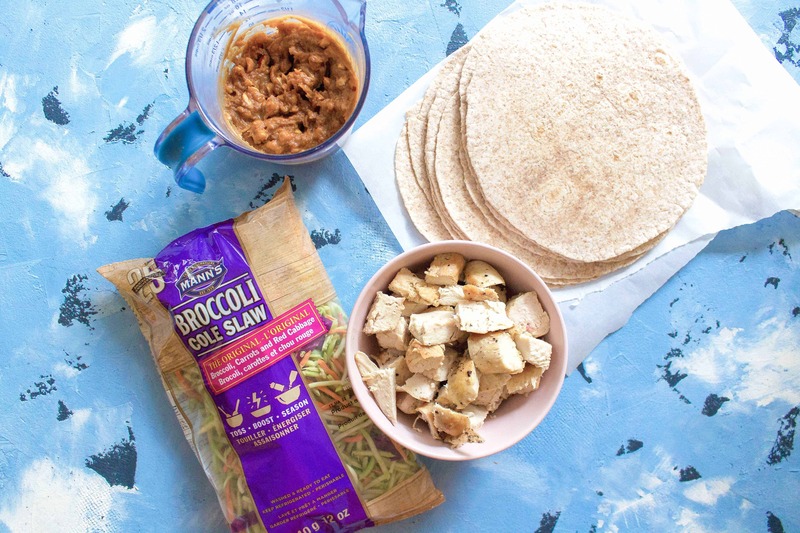 I also liked using the broccoli slaw – it made making this chicken wrap meal prep so much faster than cutting the slaw myself. Thank you! I’m glad you enjoyed this chicken wrap!